Walking through Little Dix Bay’s magnificent gardens, you take a deep breath, drawing in the sweet, earthy scent of tropical flora floating on the warm trade winds. The clear blue water of the Caribbean stretches in front of you, and the Caribbean sunshine breaks through openings in the shade, kissing you softly with its warm beams. 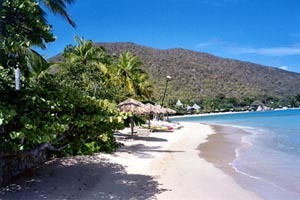 This secluded Virgin Gorda resort offers peace, tranquility, and privacy unmatched by any other in the Caribbean. Cottages and guest rooms are delicately nestled into island’s natural surroundings, preserving the lush and untamed essence of this British Virgin Island. Each of Little Dix Bay’s rooms, suites, and villas is stylishly decorated in natural wood and white with blue accents throughout. The warm and personal mood invites you to relax in complete comfort. Each room is complete with a variety of amenities, ensuring your vacation in paradise is nothing short of perfect. The resort also offers a variety of complimentary activities, including tennis court, fitness center, table tennis, pool tables, nightly movies, sunfish sailing lessons, guided snorkel tours, an invitation to the managing director’s weekly cocktail reception, and more. For those who are content with simply lounging on the beach, allowing the Caribbean sun to cast a golden glow over your skin, Little Dix Bay has exactly what you are looking for. Considered one of the most beautiful in the world, the crescent beach that stretches the shore of Little Dix Bay offers calm, clear water and powder-soft white sand. The beach is also protected by a magnificent coral reef, which provides spectacular snorkeling. Enjoy delicious meals served with Caribbean flair at any of the resort’s three fabulous restaurants. For a special evening for two, spark a little romance at The Sugar Mill. Each table offers spectacular panoramic views of the Caribbean Sea and the menu is an eclectic blend of pan-Asian and European cuisine. Dine The Pavilion, located in the heart of the resort, for delectable international cuisine. At lunch, enjoy the buffet, a pleasing combination of fresh grilled meats, matched with leafy green salads, mixed vegetables, fine cheeses, and tasty sandwiches. Enjoy daily afternoon tea at the bar, and magnificent the sweeping views from the open-air pavilion. 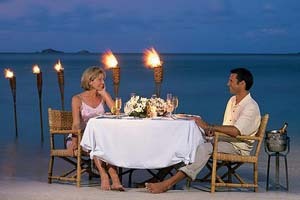 For a laid-back dining experience, eat at the Little Dix Bay’s The Beach Grill, located just footsteps from the beach. Here guests can enjoy a variety of imaginative cocktails as well as pizza, burgers, chilled soups, salads, and sandwiches. Take a day to indulge in Sense, the resort’s luxury spa. Located on the cliff’s edge, Sense’s dramatic views over Sir Francis Drake Channel and the rest of the resort are absolutely breathtaking. Allow yourself to be pampered with signature treatments, including a Virgin Gorda Milk and Honey Wrap or a Salt Island Scrub. Partake in Yoga, Pilates, and meditation classes and feel completely refreshed. From the white sand beach to the verdant gardens to the delectable dining, Little Dix Bay is a Caribbean dream come true.